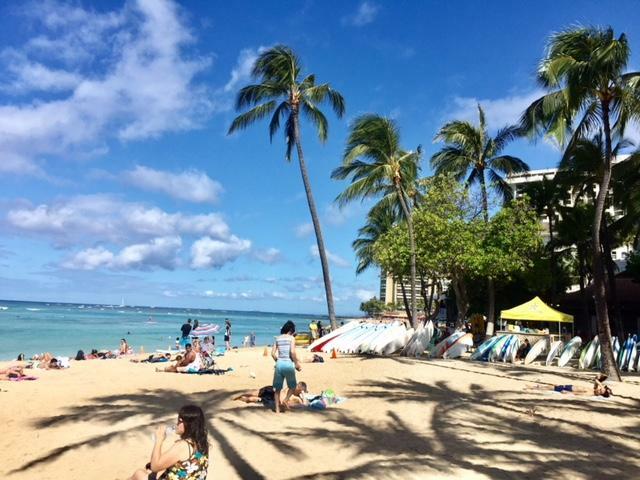 Millions of tourists visit Kuhio Beach, in the center of Waikiki, every year. Two Honolulu City-run concessions offer surfboard rentals, lessons, and canoe rides year round. Both concession contracts have been granted to a new operator, and changes are in store. Auntie Laurie Saxman has been working for Star Beach Boys over 30 years. She says she was raised on Kuhio Beach and raised her family here too. She lives on Liliuokalani Avenue, her kids live on Kaiulani Avenue, she and her son in law walk a couple blocks to work at the beach. A change over in management at the city's two beach boy concessions will likely mean the end of an era. Beach Boy Auntie Laurie Saxman shares a little about the life. 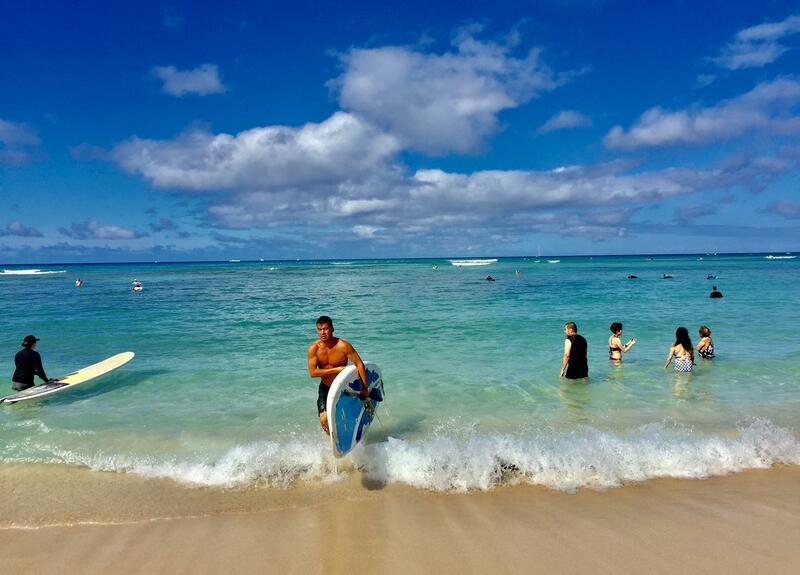 It's puffy whites in a flawless sky this morning on Kuhio Beach in Waikiki. Wavelets lap the sand and sunlight sparkles invitingly, filling your eyes all the way to the horizon. Waikiki Beach in the early morning is a sight for sore urban eyes. "We’re not leaving physically, it’s just that lifestyle that’s in question right now." Beach boy, Auntie Laurie Saxman, grew up on Waikiki beach with Star Beach Boys, which began in 1972. She’s concerned about a new company, Dive O’ahu, which recently won the city’s two beach boy concession contracts. Hubert Chang is President of Hawaiian Oceans Waikiki, they’ve managed a beach boy stand for nearly 14 years. Chang: I can’t speak for others, but I have workers who are salaried and hourly for different tasks. Then I have some like instructors, captains, second captains, they come when they want and they work when they want. Chang: People go to another company and they come back, and vice versa. It’s a very romantic lifestyle. I accept that. 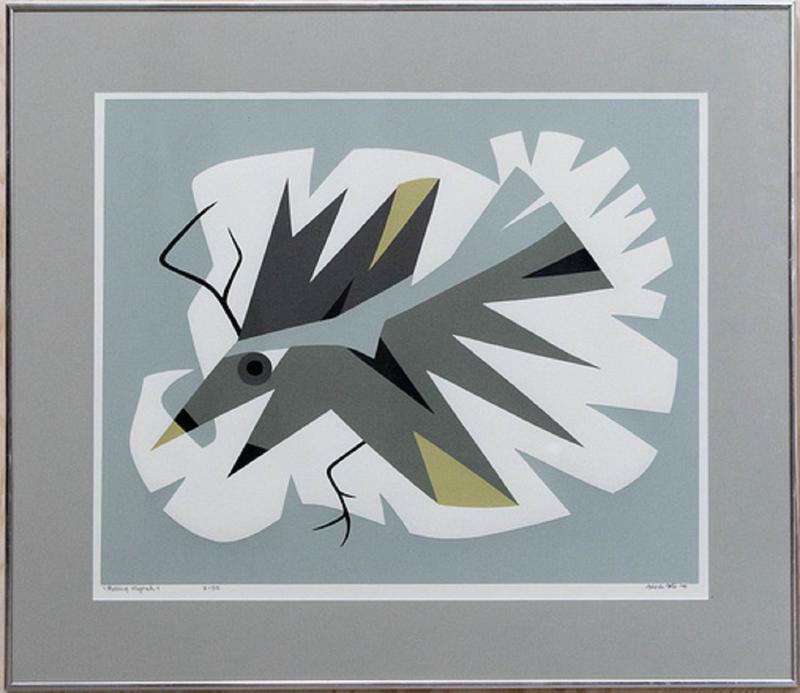 Aaron Rutledge took over his grandfather’s business when he graduated high school in ’88. Rutledge: I grew up into it. The guys I got working with me, they grew up into it. It’s one of those things where people don’t really come down to apply for a job. You’re just there, and next thing you know, you’re working. Rutledge says canoe captains and surf instructors are independent contractors. How do people make a living? Rutledge: We have employees and the instructors are independent contractors. They’re on their own schedule. If they want to work today, they come to work today. If they don’t want to come to work tomorrow, they don’t come to work. So they’re on their own schedule. Rutledge: They come down, they do the surfing lessons, they do the canoe rides, they get commissions off of that. If they’re needed at another concession, they go work on that side. So they kind of just float. It’s a viable living, though? Rutledge: Yeah. Some of them have other jobs, but the majority of them this is all they do. The live within their means. Ain’t nobody driving brand new cars and stuff like that, but they’re happy. Main thing is, you’re happy. Or, is it more important to have benefits and possibly overtime? "We are going to be paying as an employee and not as an independent contractor so there will be benefits according to the Department of Labor." 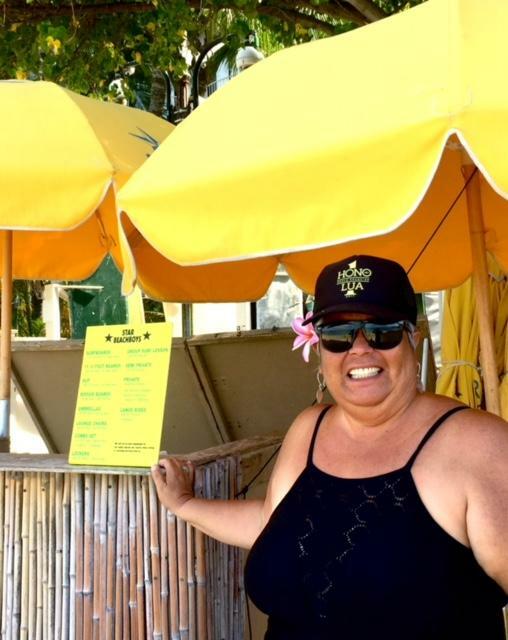 Shelley Rofrits is the manager of Dive O’ahu, the firm that won both beach boy concession contracts. She says about ten beach boys have joined their operation. Rofrits: The new City and County contract requires a uniform, it requires a TB clearance, valid current lifeguard certification and a valid instructor card through DLNR. It requires a drug test as well for all surf instructors and canoe captains. New rules also require an electronic payment device that can generate a receipt, giving rise to images of guys in khaki shorts and polos, with iPads and nametags roaming the beach. Rofrits says there will be a set schedule, and while teaching, instructors will be paid hourly minimum plus commission up to $30-$55 dollars per hour. Rofrits: Whoever won the contract going forward, was going to have to follow these guidelines. Yesterday, Star Beachboys lost their bid for a delay and are under pressure to move out quickly. They’ll challenge the bid process in court in July. Hawaiian Oceans says leaving is just a matter of time for them. Saxman: We’ll still be here. We are from Waikiki. This is our home. This is not just where we come to work, this is our home. I live on Lili'uokalani, my keiki live on Ka'iulani avenue. This is us. I’ve been on this beach since six years old. I remember the old days of Waikiki. Saxman: The saddest thing is seeing my grandson on television. He’s eight years old and they were doing this story. I thought to myself, Wow, he’ll never see this. At this moment, he’ll never be able to really fully experience what I have experienced and his dad has experienced and his mom. The keiki today will never. Saxman: Like I always said, Calise, you’ll always have a job with Uncle Aaron! But that’s not going to happen now. 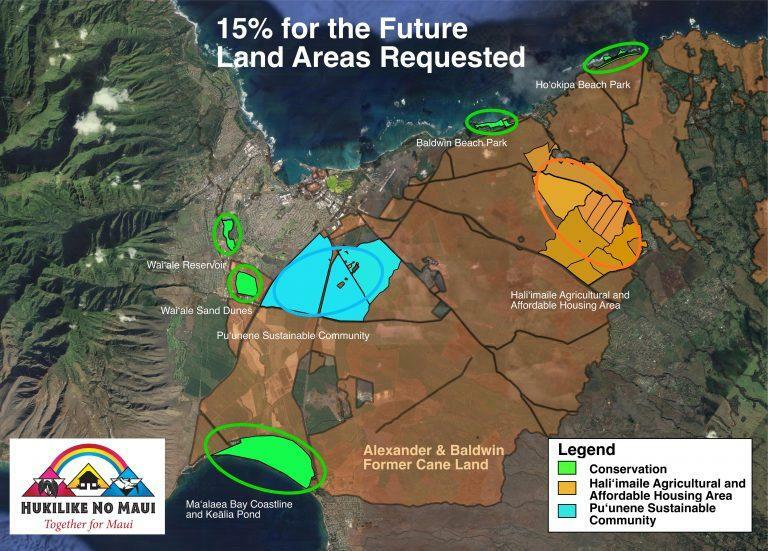 Honolulu City Corporation Counsel Donna Leong says the new city contract aimed for allowing different ocean activities to be offered, which may or may not include surfing and canoe riding. She says the goal of requiring an electronic payment mechanism is so that the City can better monitor the concession's income. Leong noted that in her experience in the visitor industry, uniforms make service providers more visible for tourists. Starting maybe today, Auntie Laurie won’t be putting on her bathing suit and walking to the ocean to work. Still, every morning, bird tracks in the sand, the sun beams as generously as it ever has, and waves sparkle out to the horizon. Mayor Caldwell's Communications Director Andrew Pereira, answered several questions that protestors of the new beach stand are asking. Why are the beach stands employees required to wear uniforms and name tags? The requirement for uniforms and name tags is so that the beach stand concession employees are readily identifiable by customers and the general public. Also, managers, assistant managers, or supervisors must be identified on the name tag with their title and shall be responsible for answering all questions or complaints about the operation. The contract, and General Terms and Conditions for all Concession Contracts, states: "The Concessionaire's employees shall be uniformed and wear name tags identifying themselves and the Concessionaire. The final design of the uniform shall be approved by the OIC." A schedule is required so that the concession is adequately staffed with employees to provide efficient and prompt service at all times. The contract specifies the hours the concession must be open, which are daylight hours, so that the City can ensure the concession services will be available to the public during the times the services would be desired. The contract states: "The Concessionaire shall maintain an adequate and trained staff of employees to provide efficient, prompt and courteous service at all times. The OIC make the final determination regarding the number of employees required to be on duty. The General Terms and Conditions for all Concession Contracts requires that ALL City concessionaires: "The Concessionaire shall maintain an adequate and trained staff of employees or hired staff to provide efficient, prompt and courteous service at all times. The Officer-in-Charge shall be the final authority in determining the number of employees or hired staff need on duty." The contract requires: "The Concessionaire shall be in operation daily between the hours of 6:00 AM to 6:00 PM during Summer months or 6:30 AM to 5:30 PM during winter months weather permitting unless otherwise approved by the OIC and the Director of the Department of Parks and Recreation." Are employees required to remain at the stands or can they roam the beach? 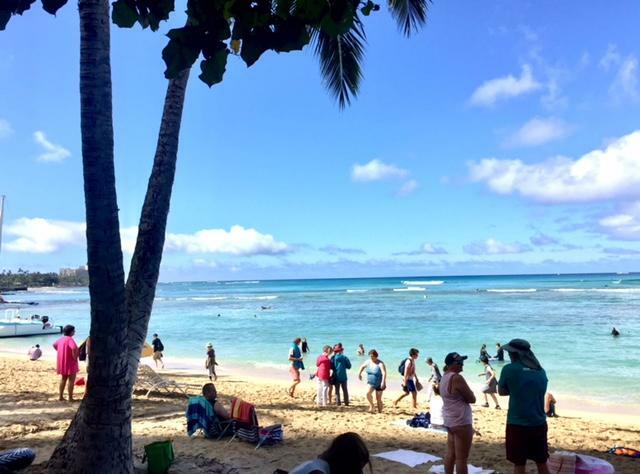 To adequately staff the concession and service customers, the employee shall remain at the stands unless their job duties require them to leave, such as give a surf lesson or canoe ride, help people set up umbrellas, and so on. The contract requires: "The Concessionaire shall maintain an adequate and trained staff of employees to provide efficient, prompt and courteous service at all times. The OIC make the final determination regarding the number of employees required to be on duty. Can Dive Oahu sell luau tickets, etc. at the stand? 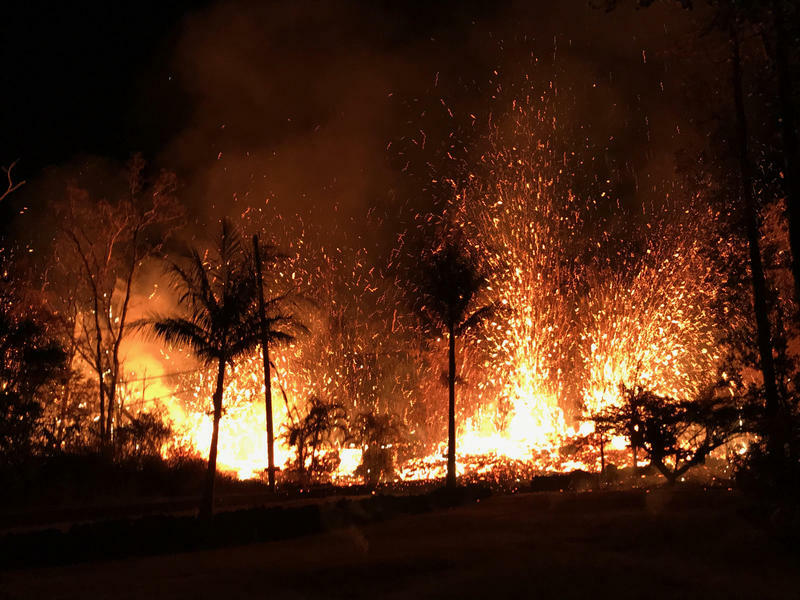 Aaron Rutledge, proprietor of Star Beach Boys, told HPR that their complaint against the city was continued last Friday. The judge refused the City’s motion to dismiss. 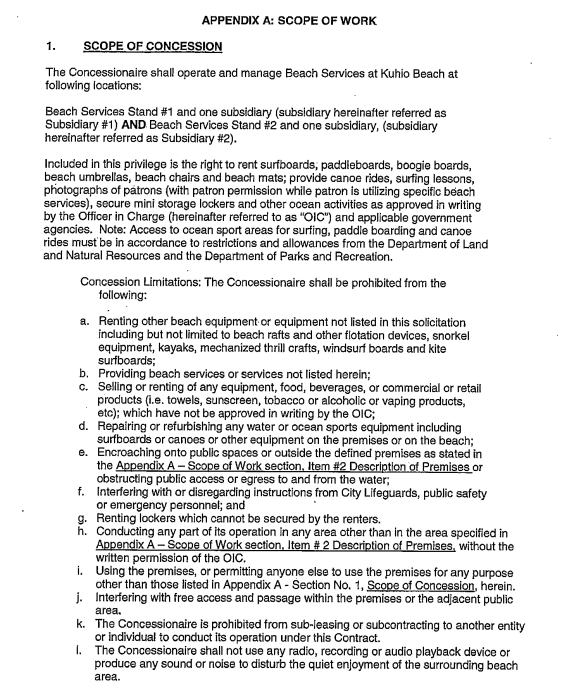 The City now has 30 days to respond to Rutledge’s allegations of improprieties in the bidding process that led to awarding Kuhio Beach’s two beach boy concessions to Dive O’ahu. Meanwhile, it’s been weeks of tense relations on the beach. Star has opened a small store front across from Kuhio Beach, and beach boys just navigate customers across the street.